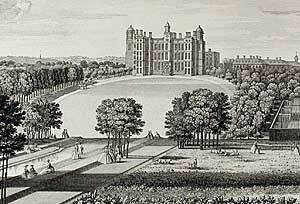 The Elizabethan Worksop Manor as seen in the 18th century. The stately manor-house which the Earl of Shrewsbury had erected was burnt in 1761, and the present edifice built on its site four years later. The old house is said to have had no less than 500 rooms, and the loss caused by the fire was estimated at £100,000. Horace Walpole, writing to Richard Bentley, in 1756, says of his visit to Worksop, The house is huge; one of the magnificent works of old Bess of Hardwick, who guarded the Queen of Scots here for some time in a wretched little bedchamber within her own lofty one. The wretched little bedchamber is regarded as a fiction, though there is no doubt the Queen was very closely guarded, for the Earl (writing to Baldwin in 1583) says, She was never out of my park during her abode at Worksop. The present mansion is a very fine and commodious residence, and is now the seat of Mr. John Robinson. Thus far we have dealt with the famous owners of Worksop, and apart from them and their doings there is little to say. The history of the town is essentially that of its ancient abbey church and manor-house. Of the former some picturesque ruins remain, which are well worthy of inspection. Evelyn, in his Diary, says, The church has a double flat tower, entire, and a pretty gate. The manor belongs to the Earl of Arundel, and has to it a fair house at the foot of the hill in the park, that offers a delicate prospect. Both the abbey gate and the church have long excited the admiration of all who have inspected them. The church has been well described as a proud monument of ancient ecclesiastical magnificence. It constituted, according to Dugdale, the west end of the priory church, and its two lofty towers give it an imposing appearance, though we can scarcely endorse the opinion that it strikes the eye of the beholder with an impression equal to that of Westminster Abbey. The interior of the sacred edifice is very striking, and a grand specimen of early architecture. 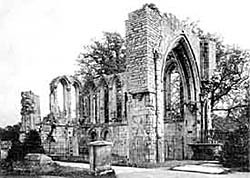 Ruins of St Mary's Chapel in the early 1900s. Of ancient monuments the only remains are three broken effigies at the west end of the church, one of a lady and two others of knights in armour, supposed to represent members of the family of Lovetot. Several stone coffins have been dug up, and are to be seen close to the south wall. Near the east end of the church, with which it was formerly connected, are the ruins of St. Marys Chapel, which was evidently a fine structure in the Early English style. It used to be attached to the east side of the transept, the church having originally been erected in the form of a cross. The priory gateway is another pleasing specimen of old architecture. It stands some distance from the south front of the church, by the side of the present churchyard. It used to have a double gate with a wicket. It now serves as the entrance to a road leading past the west end of the church. Of modern memorials within the sacred edifice mention may be made of a tablet to Barry St. Leger, Esq., who died December 26, 1793, and who was Commander-in-Chief of his Majestys forces in the province of Canada. He was a brave and humane officer, and served his country with zeal and fidelity for 32 years. There are also memorial windows to members of the Foljambe and other respected local families.